Even though it isn't scheduled for completion until sometime in 2015, Provo City officials believe the new Provo City Center Temple of The Church of Jesus Christ of Latter-day Saints is a blessing to their city's downtown area aesthetically, spiritually and economically. 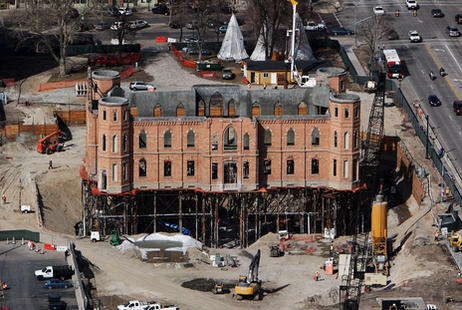 "After the (December 2010) fire that pretty much gutted the church's old Provo Tabernacle, they could have tipped it over and sold the property or done anything they wanted with it," said Dixon Holmes, deputy mayor in the Mayor's Office of Economic Development. "But instead, they felt a commitment to downtown Provo, they put a stake in the ground and said, 'We're going to invest in this area.'"